Kota Bharu, Kelantan is a place I always love, because that's the place I remember fondly from my childhood. During the longest break in the school years, my mum always brought us to Kota Bharu to visit my grandparents, uncles, aunties, and cousins. Me and my siblings always had lots of fun and wish we could stayed there longer so that we would have had more fun times together with our cousins. I miss all the happy days of my childhood! It's been more than 10 years I never go back to Kota Bharu, ever since my grandparents passed away. Mum said she missed her hometown; so here I am, returning to my childhood to remember memories from the earliest years of my life. 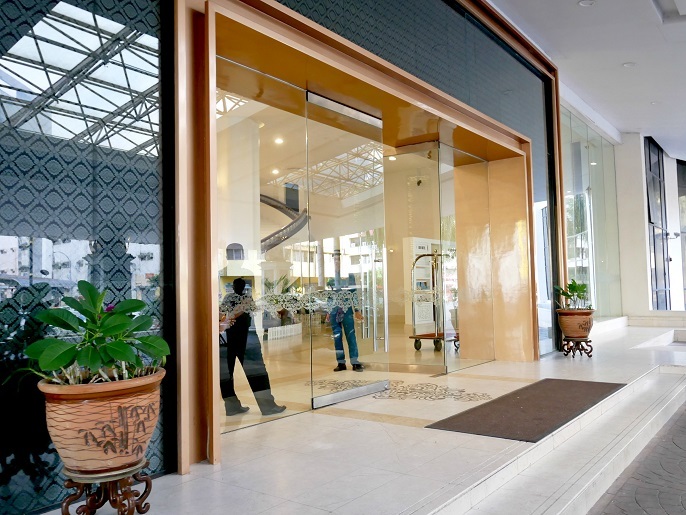 We took about a week to decide on the hotel, either at the Grand Riverview Hotel or Hotel Perdana Kota Bharu. 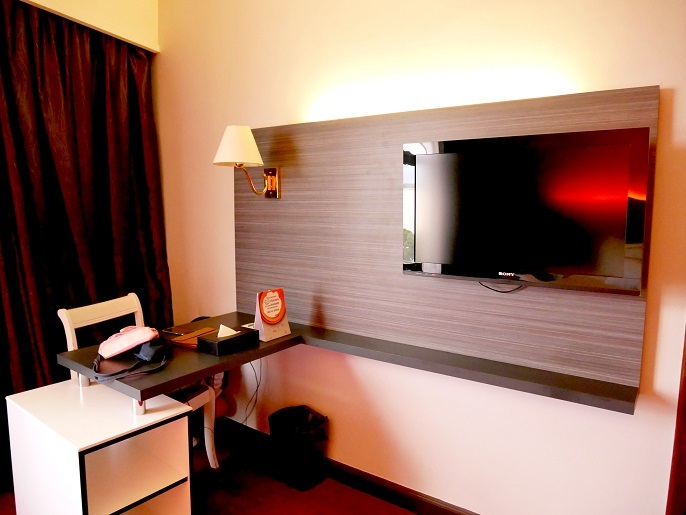 Both hotels have almost the same room rates, which is about RM250 for one night. 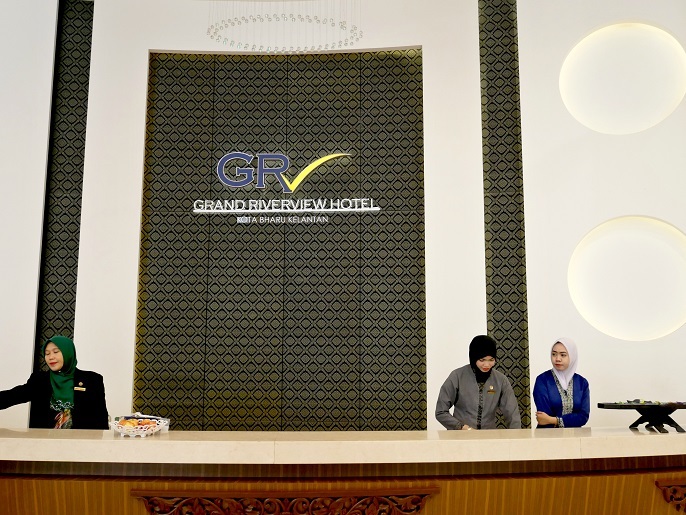 We almost wanted to confirm our booking with the Hotel Perdana Kota Bharu, but mum said it's quite far from the center of the town which might not very convenient; so at the end, our final decision went to the Grand Riverview Hotel. We booked 3 standard rooms, of 2 nights stay. 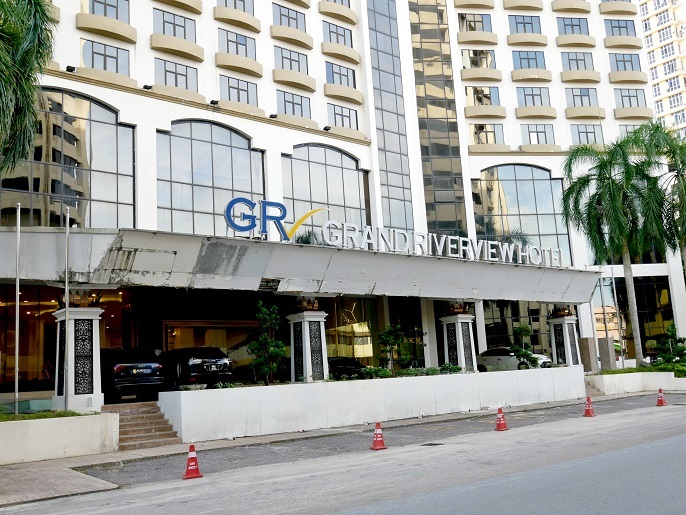 The Grand Riverview Hotel is rated as 4-star hotel, but it's not at all. 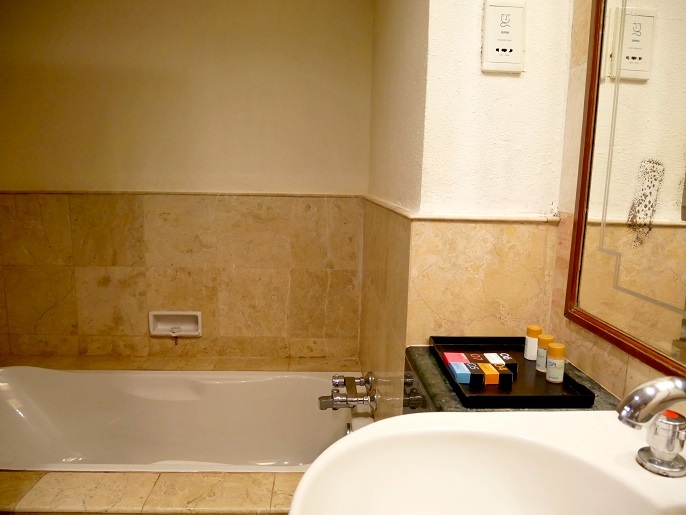 We felt very disappointed on the first day, and I think 90% of our disappointments are from the fact that this hotel is not worth the 4-star hotel rating. From the outside, the hotel looks huge and also like an upper mid-range hotel. 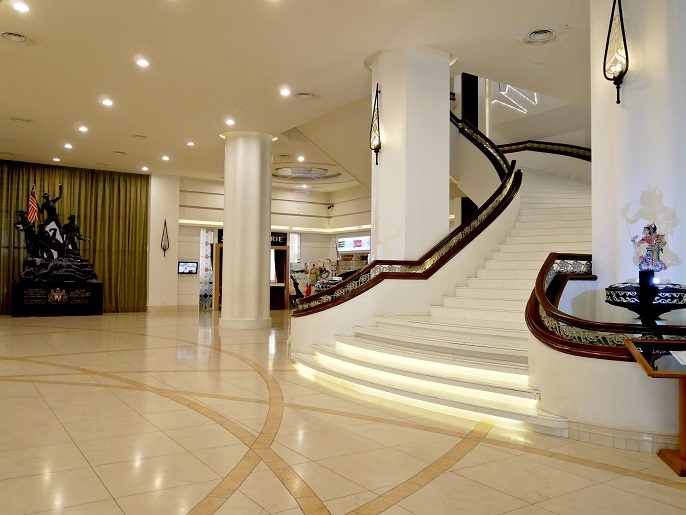 Once you walk into the lobby, it is really big and grand. 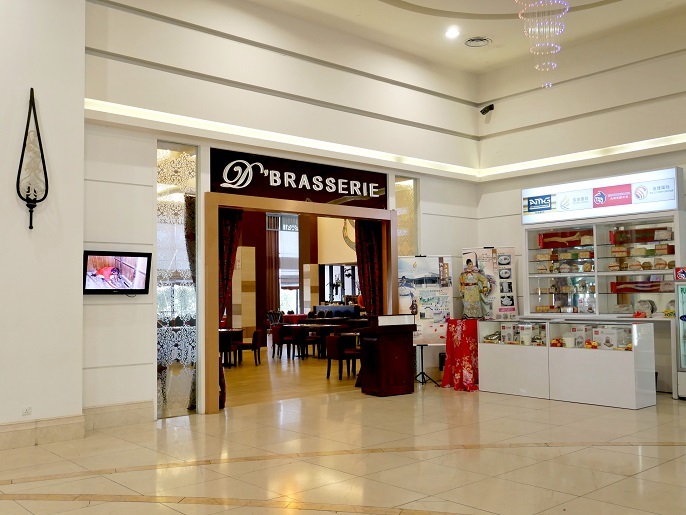 It has high ceiling with beautiful stairway on the right side. 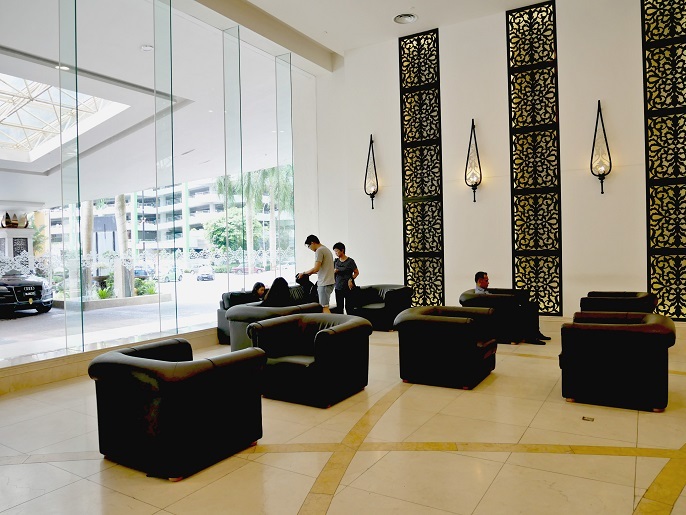 A large public seating area for guests on the left side right after the main entrance. The first disappointment happened during our check-in process. We first arrived there at about 3 in the afternoon, it's the right time to check-in, yet we were told that our rooms were not ready due to the late check-out from the previous guests. It was quite upset because all of us woke up at 6 in the morning, and would want to freshen up before the next itinerary. The receptionist advised us to come back after an hour and promised the room will get ready by then. Sadly, after 2 hours later, at about 5.30pm; the rooms were not ready again. We had enough patients, and my mum was very tired and need some rests. So, the receptionist had no choice and proceed one room for us. The second disappointment happened when we entered to the first standard room. 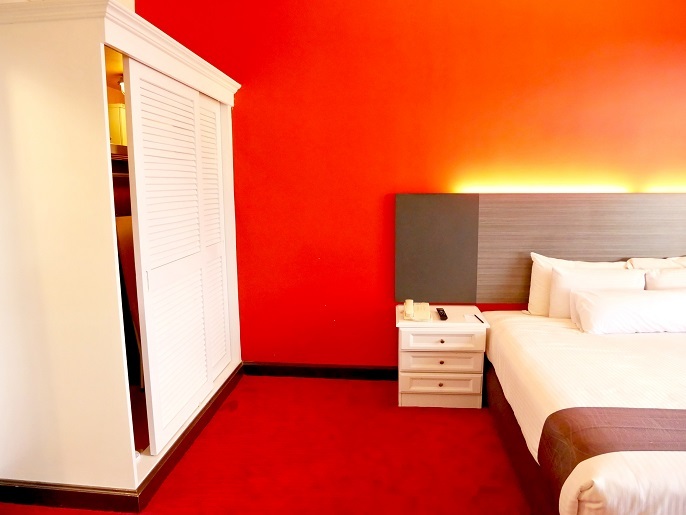 Obviously the room was not ready yet; the carpet was uncleaned, the pillows were placed in the middle of the bed, also one of the pillow was without pillow case. When my brother walked into the bathroom, the floor was dirty and had some stains. Without a second thought, we went down to the reception to complaint. 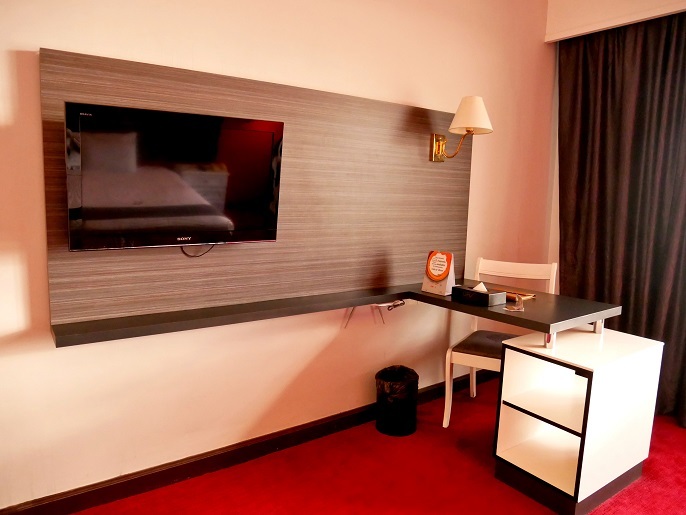 The check-in staff felt sorry for us and upgraded the room to a suite room, without any charges. This is the suite room they upgraded for my mum and nieces. 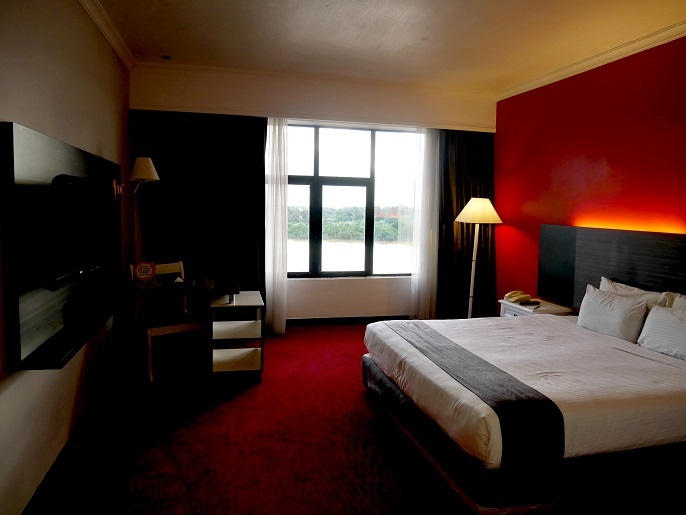 The room is very spacious with 2 separate ambiances, a bedroom and a private dining room. Well, it definitely looked much better than the standard room we got previously. 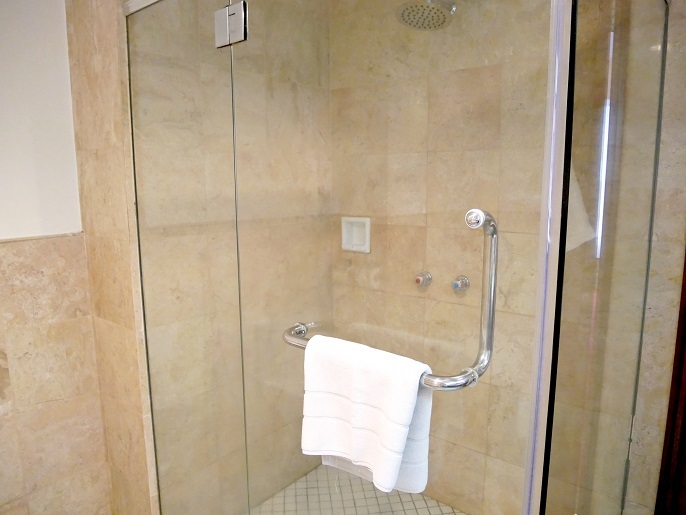 The bathroom is big, with separate shower glass room. However, it looks a bit old and grubby which gave an unpleasant and comfortable feeling. 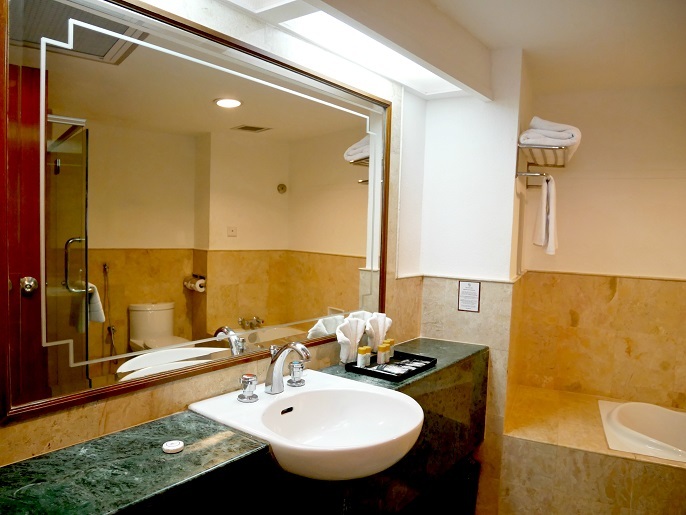 Well, I would expected a better clean bathroom for a 4-star hotel. 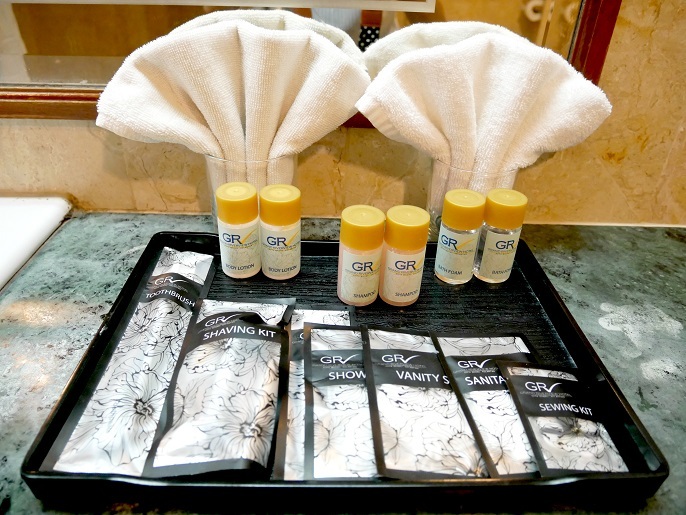 Suite room provides a better exclusive toiletries than the standard room. 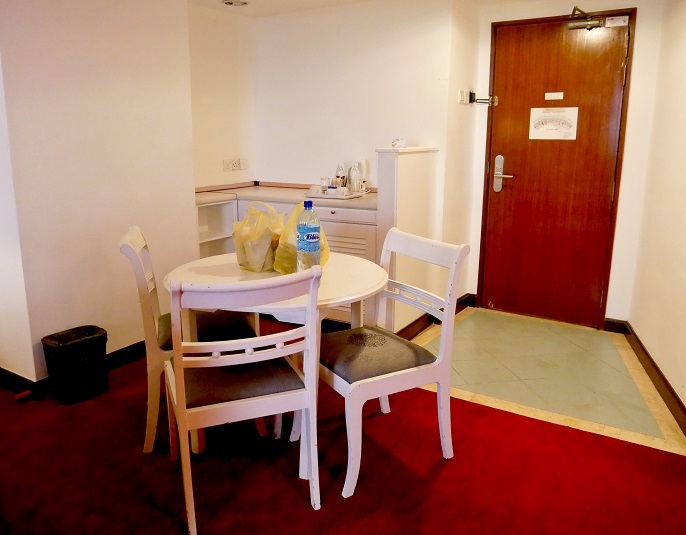 Best thing about the suite room is it has a dining room which allows to accommodate at least 4-5 person. However, when you look carefully on the pictures, all furniture looks very old. The sofas need some cares for maintenance for sure, also I can see dirt and stains sticking on the white dining table too. 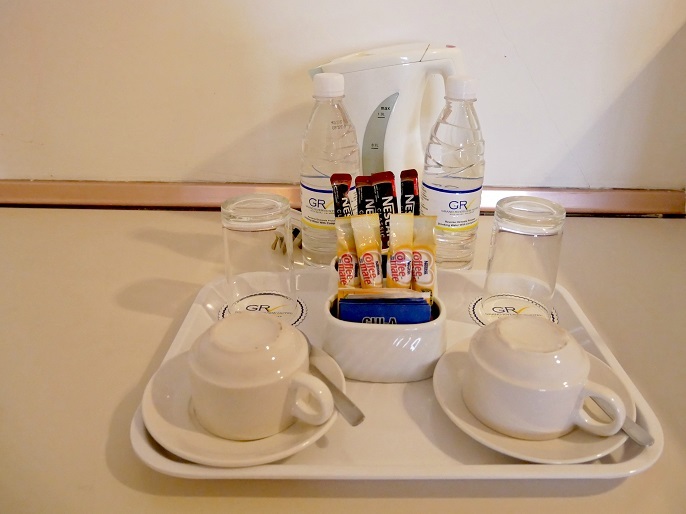 Both suite and standard rooms provide complimentary of bottles of mineral water, instant coffees and tea bags. There is also a mini bar selection inside the refrigerator. With all the upset feelings to deal with, the check-in staff said we can enjoy the mini bar selection for free, but when we opened the refrigerator, it's empty! #what? The third disappointment happened when we walked into the second standard room. The room was dark, because the curtains were all closed (I thought hotel rooms should leave the curtains open?). Besides, the room lights were disabled though we slotted in the room card. So, we went to the receptionist once again for another new room. Overall, the new room looked just fine; but the wall paper had dark stain, also we can hear the loud springy noise of the mattress which could be the mattress springs worn over time. Actually the same issues happened to another standard room that my brother stayed over. That's definitely never be a welcome sound for any guests! 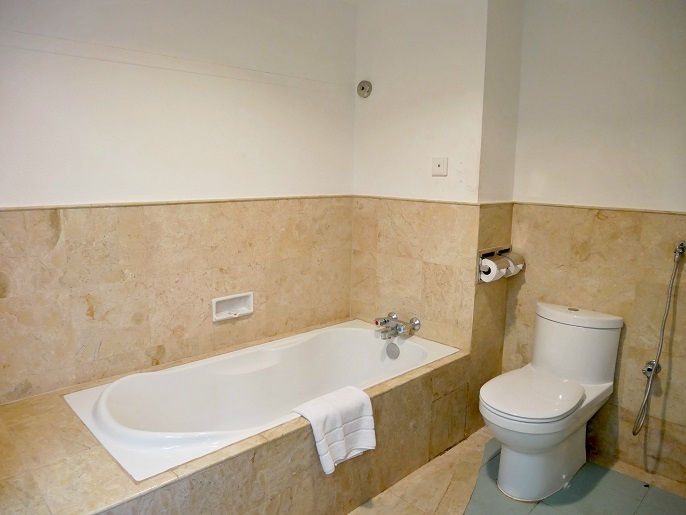 Consider the bathroom is a typical sized for a standard room, with a bathtub and separated shower room. Apart from that, on the next morning, I asked for a hair dryer because I could't find it in the room. Guess what?! The staff said they don't have enough hair dryer and might not be able to send one to my room! 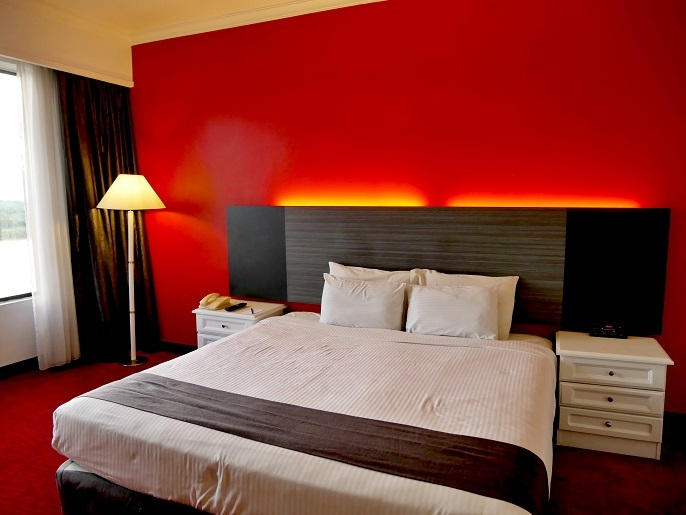 #whata4starhotel! 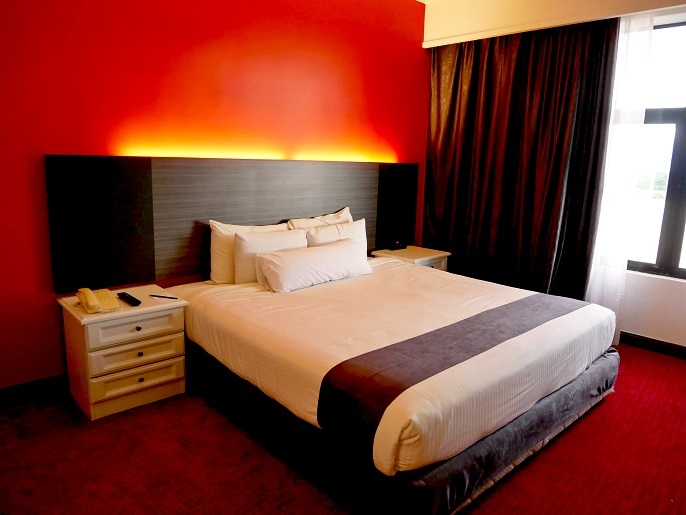 All room packages do not allow you to choose rooms without breakfast because they offer free breakfast to everyone. The buffet breakfast is ok, with a wide selection to choose from, but please don't expect too much. Btw, this is the view from our room. 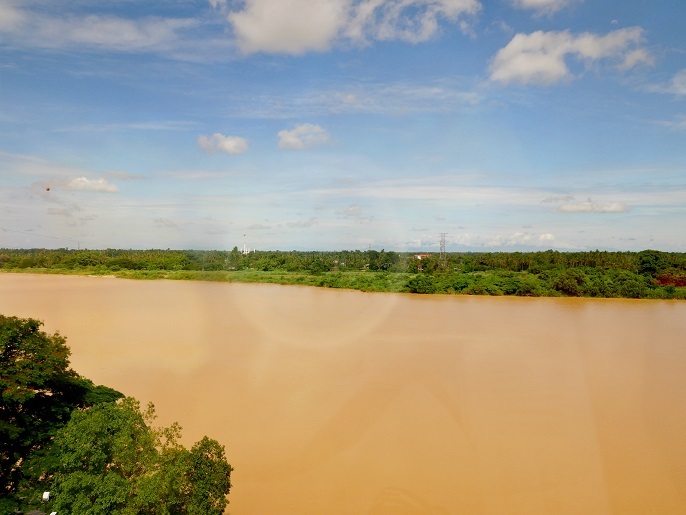 I feel so sorry to write such bad reviews about the Grand Riverview hotel, yet I think it's good to share my experience with my readers as well as to the hotel management. I really think the hotel needs a serious improvement and upgrading works because everything in the room are very old and dirty. 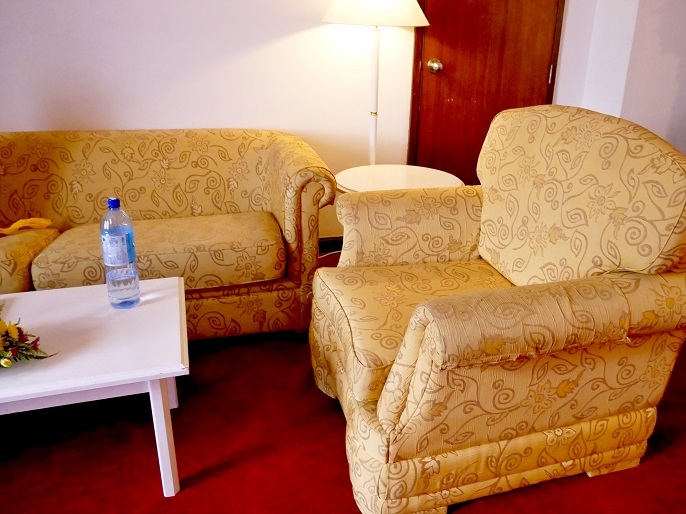 I think no matter you run a 5-star hotel or a budget hotel, it's very important to keep all places clean and comfortable, without dirt and dust. You can't disappoint or upset your guests while they are on their vacations or business trips! Overall, I just find this is not what we had expected to pay for a 4-star hotel when we actually get a 3-star hotel instead. 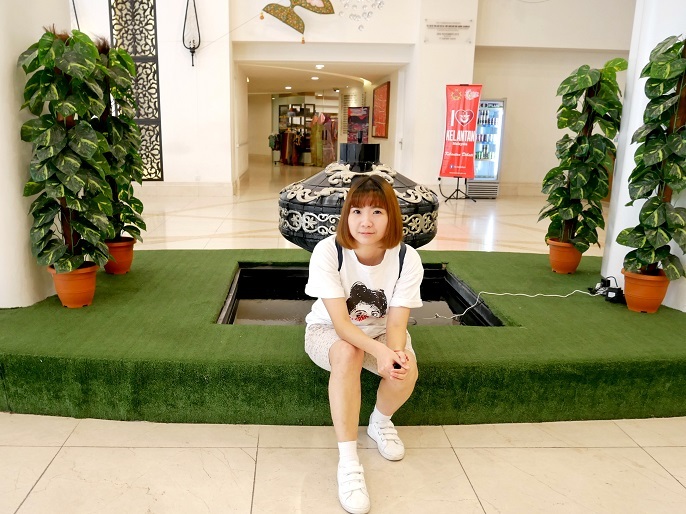 That's all I want to share about the Grand Riverview Hotel, hope you will find the post is nice to read! See you on my next post soon! Ciao!